Food production is caught in the middle of a profound cultural shift in America. Growing awareness of the nutritional and environmental ramifications of the things we eat is changing the way Americans buy and prepare food. It’s also changing the way scientists think about farming. Beginning in the 1940s with the advent of the green revolution, scientists in this country have spent the last several decades finding ways to mechanize, automate, and increase the scale of food production. As the pendulum swings back the other way, however, scientists are looking at new ways to produce food. Aquaponics is an innovative technique that combines aquaculture with hydroponic farming. By taking an ecosystem approach to food production, aquaponics has the potential to produce greater yields – of both fish and vegetables – than conventional agricultural, all without any chemical fertilizers. Aquaculture refers to the cultivation of aquatic animals, such as fish, shrimp or shellfish. Hydroponics is a technique by which plants grow directly in nutrient-enriched water without dirt. Aquaponics is the synergistic combination of the two, in which the weaknesses of one system become strengths of the other. 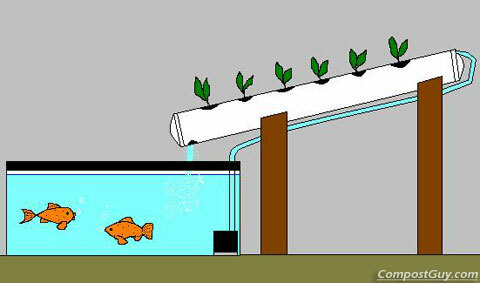 A typical aquaponic system features a fish tank connected to an irrigated growbed. Water is circulated back and forth between the two; in the fish tank, fish effluents fertilize the water, while in the growbed these waste products are broken down by nitrogen-fixing bacteria and then absorbed by the plants. Fish fertilize the water for the plants and the plants remove nitrogenous wastes before they can build up to toxic levels for the fish. Aquaponics is more than just a clever way to combine fish and vegetables; scientists believe that it could hold the answers to two of the most significant problems facing the next generation of farmers in America and around the world. The first lies in its water efficiency. Population growth and climate change are projected to make fresh water an increasingly scarce and valuable resource in the coming century. Aquaponic systems are recirculating, meaning that the same water goes through the cycle again and again. This makes aquaponics the most water-efficient farming technique on earth – requiring as little as 5% of the water required for soil-based agriculture. Aquaponics is also potentially ideal for a world of shifting demographics. Globalization and the economic development of China and India have brought Western culture and, more importantly in this case, Western diets to people who did not previously have access to them. As billions of people enter the global middle class there is every reason to believe that their eating habits will shift away from vegetable-based peasant diets to the high protein diet that most Westerners are accustomed to. Without getting too technical, farmed fish can be a more environmentally friendly protein source (compared to red meat and poultry) because they are incredibly efficient at converting food into muscle. Ocean fish stocks are in decline worldwide due to overfishing; the oceans are simply incapable of supplying more fish than they already do. Aquaponics has the potential to be a viable, sustainable, and scalable way to meet this demand and fundamentally change the way food is produced. 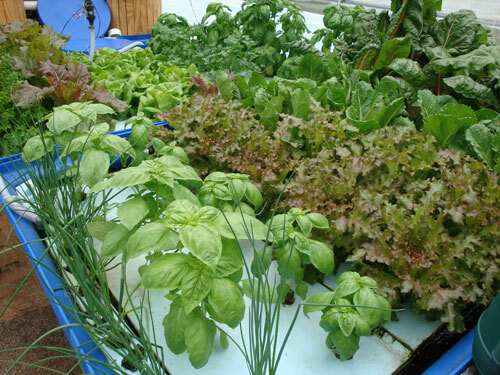 Click here for more on aquaponics.